"​She has the gift of perspective from her many years of work in this field, and from raising her own family. Plus, she is funny as anything. What a joy it was to have her with us during that special time." I attended my first birth almost 17 years ago. At this time I was living in Anchorage, Alaska, and my friend found herself in need of someone to fetch ice, keep the mood in the delivery room happy and light, and manage her family. I found the hospital kitchen, made what I still believe to be fantastic jokes, and lovingly banished 15 or so people to the waiting room, even managing to make them think it was their idea. I was hooked. 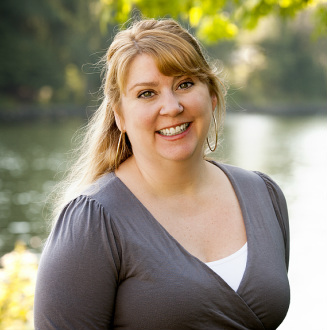 A few years later, I moved to Seattle, and became a Licensed Massage Practitioner, with an advanced certification in perinatal bodywork. I also attended birth doula training at Seattle Midwifery School, supporting my very first client on Christmas Eve of 2002. Now, I have attended over 1200 births in one capacity or another, and I am just as amazed now at women’s strength, fortitude and determination, as I was back on that holy night. After certifying with PALS (Pacific Association for Labor Support, and the oldest doula professional group in the country), I was ready for more. I attended every training I could, and eventually decided to become a Certified Professional Midwife, a medical practitioner who specializes in out of hospital birth. During my training, I was fortunate to work in the Philippines for a time, igniting a spark for development and international aid work. After receiving my midwifery certification, I continued this interest by working closely with Shanti Uganda, (www.shantiuganda.org) a birth and community center in rural East Africa. I have taught multiple workshops there for both midwives and doulas, developing the very first international doula training in the world. Back at home, I began to actually utilize my dusty old English degree and began writing about my birth thoughts and ideas. In 2013 I co-wrote, along with Jodilyn Owen, what some consider to by the definitive book on modern homebirth, “The Essential Homebirth Guide,” published by Simon and Schuster. We blog at www.essentialmidwifery.com, and some of my older experiences and words can be found at www.janedrichta.wordpress.com. We also are regular contributors to “Empowering Birth” magazine, with our regular column, “Ask the Midwife.” I have presented at national midwifery conferences, including Trust Birth and Midwifery Today. Lately, my interest has evolved towards the post partum period, and I added Newborn Care Specialist to my CV. This can be a beautiful, scary, shadowy, tearful, joyous time. It can be so confusing to be at home with a newborn (or newborns). It seems there are so many systems and philosophies to choose from. As a postpartum doula, I can help you identify and implement early parenting skills based on YOUR values. Nobody knows your baby like you do, even if you don’t quite feel that way yet. As a midwife, I am accustomed to providing physiological and psychological support to new family, including early breastfeeding, post partum recovery, hints for recovery after a surgical birth, SIDS prevention, and caring for premature or medically fragile infants. I concentrate on overnight care, spending what are literally and emotionally often the darkest hours encouraging and problem solving. A family that is well rested and supported with hands on help, relevant information, and love can move forward into early parenting with confidence and joy. ~Jane’s rate for overnight newborn care is $225 per night. ~Jane takes a limited number of birth doula clients a year. Her rate is $1200. Please contact her for availability. 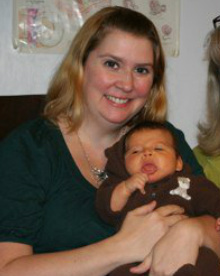 Jane specializes in vbac clients, having attended over 600 births of babies born after a previous c-section.